The Prophet was actually born on a fine June morning (it could be an afternoon, he doesnt remember exactly, because he drinks a lot) sometime in the end of the tumultuous 70's. He grew up to be a science dude. But, being a true dude (talk about an ego..) and a chip off the old block and all that crap, he enjoys good food and booze (even moonshine) so he cooks and dabbles in witche's brews. Preserving stuff is his game, beer brewing his hobby and yes, he talks about himself in the third person cause he is kinda confused. He is the quintessential anti-gourmet cook, hates small and cute portions in giant plates, white decorations and arugula. Or rocket. Dear children, I know I’ve been truant and do not write often, but I’m back now that the temperature will drop and it is again time for meats, sausages, etc. 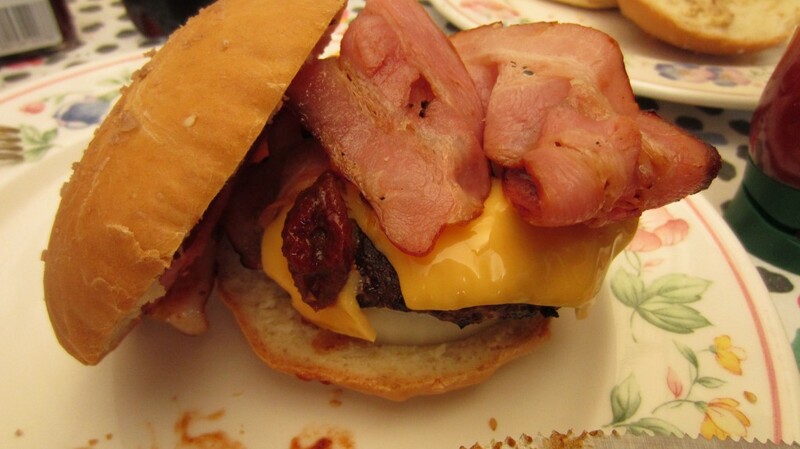 Today’s culinary hell, takes us to the much berated US of A, and its capitalist burgers. Most people love a burger, but unfortunately it’s irrevocably connected in their mind with the disgusting plastic versions in the fast food joints or even the less disgusting plastic versions of more upmarket burger places. For the latter I will admit that they serve burgers more reminiscent of normal meat than the type served in the haunts of alienated youths the world over.